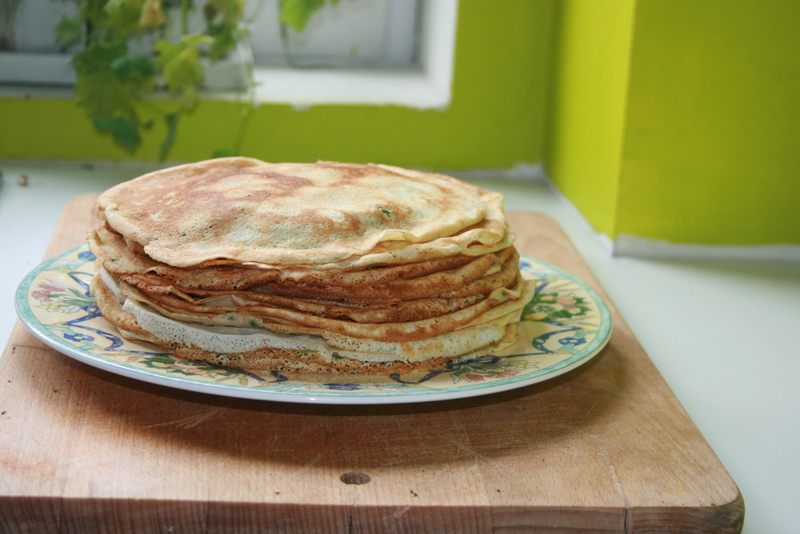 Crespelle are actually pancakes, but instead of putting sugar, you put salt (not the same amount of course). 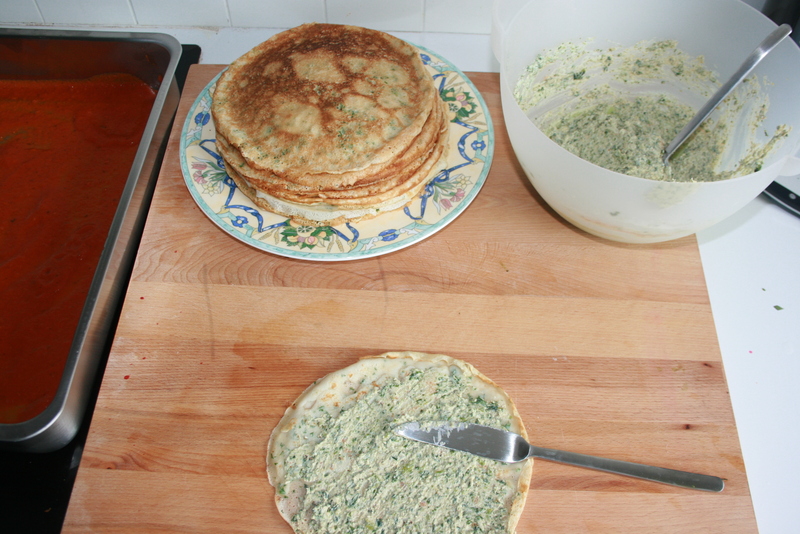 I like to serve them with a ricotta and spinach filling accompanied with a tomato sauce completing the dish. It might seem that it takes a long time to make this dish, but this is absolutely not true. Just try it! We gonna start by make all the “pancakes”. Chop the parsley (only the leafs) very very small (you can either do it by hand or machine). After chopping it put it on paper towel to dry a little bit. We do this by first putting the flour in a bowl. Add a pinch of salt and some of the milk. 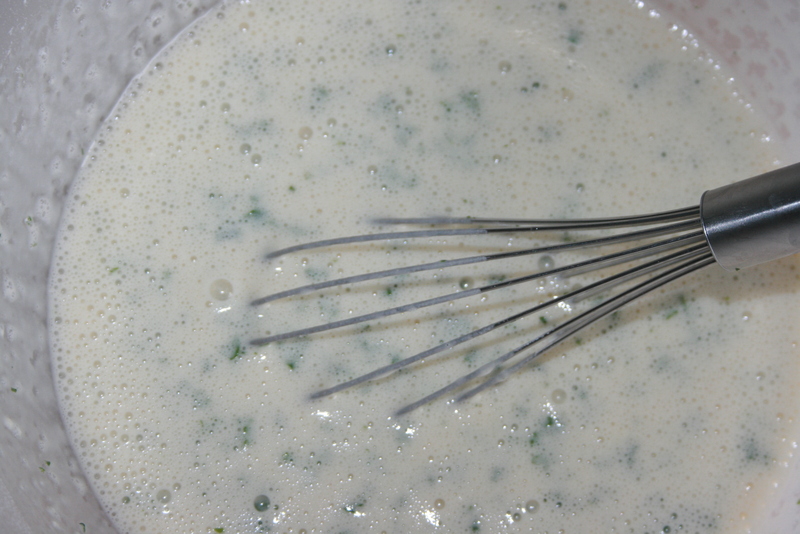 Stir it all until it becomes a nice smooth mass, now add the rest of the milk and again stir. 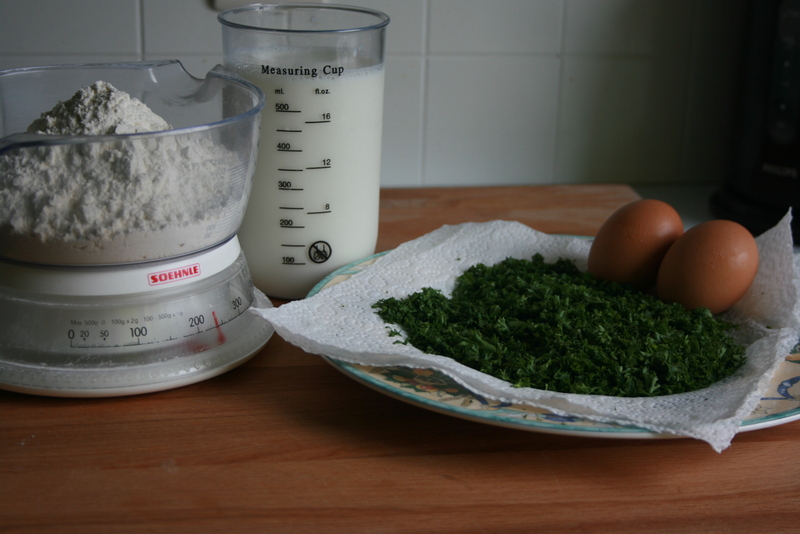 Add the first egg, once this egg is nicely mixed add the second egg. Put some butter in the pan (when the pan is very warm) and spread it with a piece of paper towel. 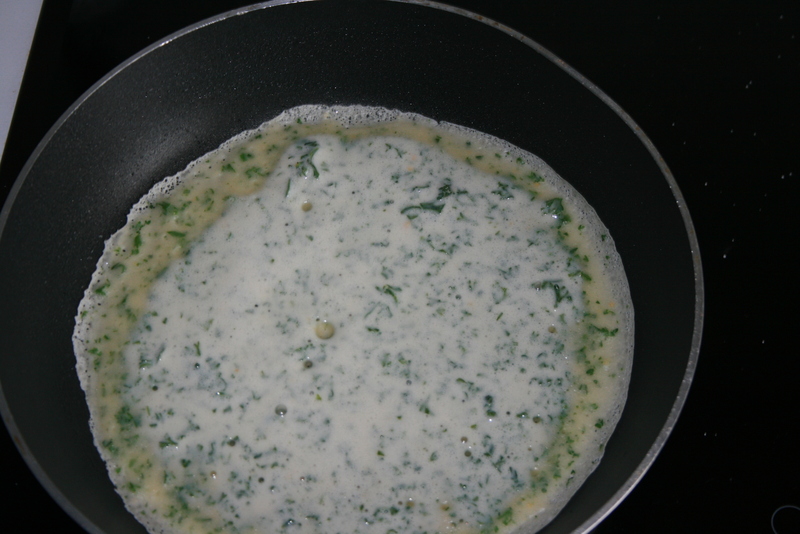 Put some of the milk mix in you pan with a Ladle (pollepel) and while poring it in your pan you turn your pan until you mix is equally spread (and you have a round form). Don’t put too much in the pan otherwise your pancakes will be too thick. Turn the pancake when you see that the top is less liquid. Keep doing this until you have finished all the mix. You now let the pancakes cool down. We first have to defrost the spinac . I usually just put it in a pot on a low heat. 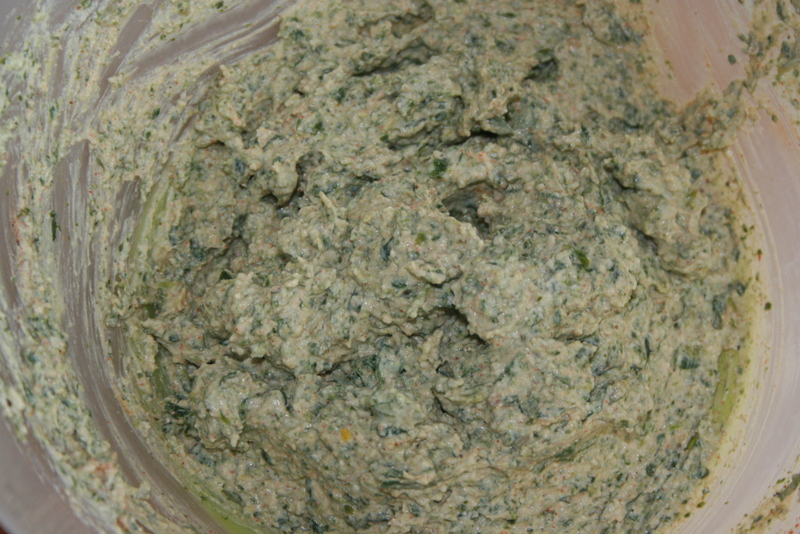 Once everything is defrosted, I let it leak through a sieve (zeef) to get rid of all the water that the spinach has absorbed. You can leave it for about 15min. For this dish I want to keep the sauce a little bit sour (not too much of course. Once you hear the garlic starts to ‘bake’ you can add the thins of tomato. Don’t throw the tins from the tomatoes away (or not yet). You notice that there is still some tomato in it. Just fill one of the thins with water. The poor that water in the next one. Then in to the last one. Now you can poor it in the pot. 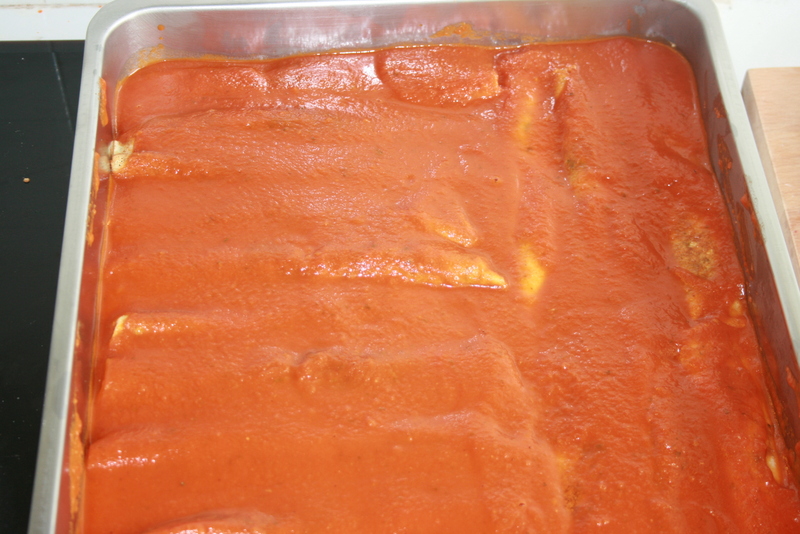 Let the tomato sauce cook for about 15 to 20 minutes on low heat. Once tray filled. To it all with tomato sauce and spread some grated Parmesan cheese over the top. Once you want to serve it, put it in a pre-heated oven of 190-195°C (374-383°F) for about 15-20 minutes. Let me know how it worked out? !